Alizee 4 from 5 first up.... I don't think Trapeze Artist was comfortable in that slow going. 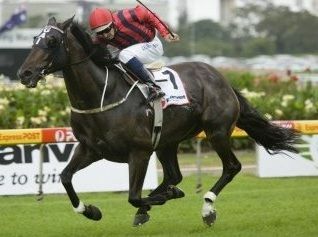 He is more a time horse ( holding the 1400m track record at Randwick) . STICK WITH HIM. Looking at his 6 runs since he broke that Rdwick 1400m record, they wouldn't set the world on fire. You could well be right, but his best run was 1400m . SO, be an interesting watch. Is Trapeze Artist being prepared to end Winx's winning streak? He would be the toughest opposition the great mare has ever faced first up and I'd say a good chance of beating her, if it wasn't for his atrocious second-up record. Comes out today and smashes another course record on the fast going. Trapeze Artist is just fine on wet tracks. The key with him is he doesn't produce his best until his 3rd and 4th runs from a spell. Ryan astutely gave him two searching trials after his first up run so he was effectively 4th up today. On his day he's the best sprinter in the country. But we don't see his best very often. Look he ran one of his best runs in the wet finishing second to Redzel in the Everest. He is a big gross horse who takes alot of training to get fit obviously. But on his day very very good. You are correct furious, those extra trials that Ryan jammed into him brought him on immensely imo, his last trial was a pearler and raced accordingly. Going to be awesome at stud! He's bred to be a stallion being from the same family as such greats as Phar Lap, Sunline, Planet Kingdom etc. Then he carries an inbreeding to the family of Redoute's Choice though Best in Show. Just like Extra Brut. So he has the female line of 2r with the dam by a 8f stallion and the sire by a 8f stallion. Everyone is raving about the Japanese superstar Almond Eye. She is from the 8f female line by a 2s female line stallion. The she is inbred to Nureyev. With all that lovely Zabeel blood which has Nureyev or Encosta and Sadler's Well's blood which carries Nureyev's dam. Probably would be nice to see some Desert Sun blood (sire of Sunline). Likewise there isn't that much Planet Kingdom blood around anymore but two that carry him are Love Conquers All and Merchant Navy. Would be interesting to see one of the Legally Bay family to to him to introduce that second line of 2r. But in all seriousness that's poor news and explains why ran so poorly.